Security Folding Gates limit right of entry to hallways and warehouse areas without limiting exposure to air or block visibility. 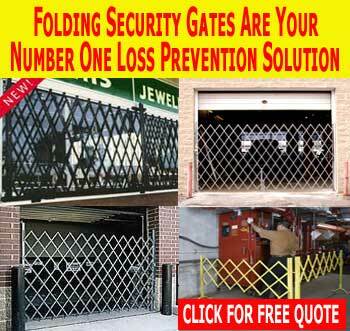 Businesses with warehouses commonly use folding security gates to guard halls, structure entrances, loading dock doors and rear entrances to commercial businesses. Learning services and medical care companies also use them to confine building admission after regular working hours. Residences and industrial companies can also gain from security folding gates when additional precautions are needed and determined appropriate. Our basic gate design is that of an interlocking web of steel, steel aircraft grade rivets are riveted back to back to offer a powerful blockade against burglary and to survive contact to the elements. Gates Open’s standard sizes range from 4-1/2′ wide by 5-1/2′ high single gates to 16′ wide by 8-1/2′ high double gates. Folding door scissor gates are made for door openings between 24″ to 48″ wide in heights from 61″ to 83″. Portable folding scissor gates are available in sizes 6 and 12 feet wide. Gates Open also offers custom made single and double folding gates up to 10′ high. Our folding door gates are designed to secure door openings ranging from 24″ to 48″ wide and 61″ to 83″ high. They provide an exclusive reversible hinge design that allows gates to be installed to either the right side or the left side of the doorway in either the casing or the face of the opening. Our folding security door gates include a locking bar that can be secured with a combination lock. When not in use, the scissor gate will pivot 180 degrees out of the way when open. Our one piece folding gates are intended for standard openings, measuring 4-1/2′ to 7-1/2′ wide and up to 8′ in height. Single folding security gates are shipped preconfigured to lock on the left but Gates Open can custom make them to lock on the right side. A ball bearing caster, welded to the lead rail of the gate, is used to assist in the expansion and withdrawal of the gate. Like door gates, single gates will pivot 180 degrees when not in use. To make up for the loss of door anchor when the gate is stretched open, a drop pin holds the center of the folding gate in place. These gates are necessary for larger openings, overhead doors, dock doors, storefronts, and bay doors in factories and warehouses. These two-piece gates can be custom fitted to any size width, and a maximum height of 10′. Because they are Double Gates, each side will pivot 180 degrees out of the way, allowing the gates to be used with dock and overhead doors in industrial facilities that need an unobstructed passage for vehicles and material handling equipment to pass through. Movable gates are routinely used in schools and medical facilities to close off hallways, eating areas, and restrictive areas within industrial or commercial businesses. They offer a two piece design consisting of dual 6′ X 6.5′ sections. They are easy to install because they are designed for standard door heights and be can be folded up for suitable storage. For particularly large entrances or hallways, additional 6′ sections can be added on.